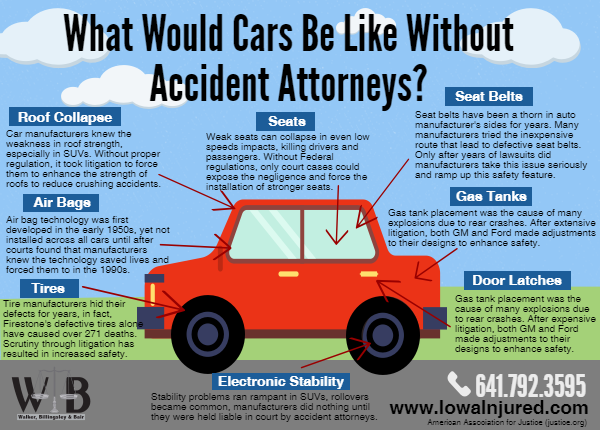 What Would Cars Be Like Without Accident Attorneys? Tire manufacturers hid their defects for years, in fact, Firestone’s defective tires alone have caused over 271 deaths. Scrutiny through litigation has resulted in increased safety. Air bag technology was first developed in the early 1950s, yet not installed across all cars until after courts found that manufacturers knew the technology saved lives and forced them to in the 1990s. Car manufacturers knew the weakness in roof strength, specifically in SUVs. Without proper regulation, it took litigation to force them to enhance the strength of the roof to reduce crushing accidents. Weak seats can collapse in even low speed impacts, killing drivers and passengers. Without Federal regulations, only court cases could expose the negligence and force the installation of stronger seats. Seat belts have been a thorn in auto manufacturer’s sides for years. Many manufacturers tried the inexpensive route that lead to defective seat belts. Only after years of lawsuits did manufacturers take this issue seriously and ramp up a safety feature. Gas tank placement was the cause of many explosions due to rear crashes. After extensive litigation, both GM and Ford made adjustments to their designs to enhance safety. Gas tank placement was the cause of many explosions due to rear crashes. After expensive litigation, both GM and Ford made adjustments to their designs to enhance safety. Stability problems ran rampant in SUVs, rollovers became common, manufacturers did nothing until they were held liable in court by accident attorneys.